با‌وجودِ اینکه قابلیت تبدیل تحقیقات دانشگاهی به محصولات تجاری، عنصر اصلی شکل‌گیری شرکتهای زایشی است، بررسی منطق انتخاب موضوع تحقیق دانشگاهی در ادبیات علمی دانشگاه کارآفرین مغفول مانده است. در این پژوهش عوامل مؤثر بر انتخاب موضوع تحقیق دانشگاهی با استفاده از روش رویش نظریه در دانشگاه صنعتی شریف به‌عنوانِ یکی از مهمترین دانشگاههای صنعتی کشور موردِ‌بررسی قرار گرفت. 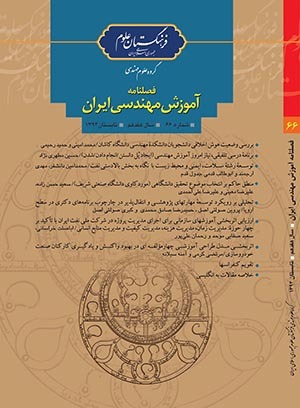 درنتیجه این تحقیق، از‌میانِ عوامل احصاء‌شده، دو عامل «اطمینان از نتیجه» و «قابلیت تدوین مقاله»، به‌عنوانِ اساسی‌ترین معیارهای انتخاب موضوع تحقیق دانشگاهی شناسایی شدند. این منطق انتخاب باعث شده است که اقبال گسترده‌ای به سمت انجام تحقیقات کلیشه‌ای با محوریت توسعۀ منفعلانه فعالیتهای تحقیقات پیشین شکل بگیرد. The third mission of the university that led to the creation of an entrepreneurial university is providing the socio-economic needs of the community in the form of commercialization of university knowledge and creation of academic entrepreneurship. However, the ability to transform academic research into commercial products is a key component of the formation of spin off companies. Review of academic research literature on entrepreneurial university reveals that the logic governing selection of subject of research and conducting it has rather been neglected .Using grounded method, as case study, Sharif University of Technology, as one of the foremost universities in the country, was examined. The main factors affecting the selection of subject and the way of performing it is derived. Among the factors recognized, insurance of reaching reasonable results and the capability of being published were two basic criteria governing this selection process. Finally some solutions to overcome this situation are introduced through practical means.